JOY Ride Slides, next to Ho Ho H2O, are three unique water slides towering three stories high and speeding through twists and turns, delivering riders to a gentle run-out (no pool). Open daily from late May into early October, provided air temperatures reach at least 65 degrees (our water is not heated). 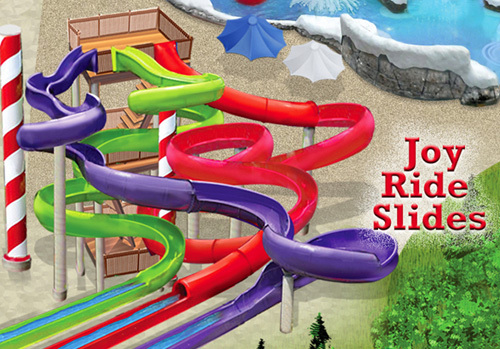 Enjoyment of the Joy Ride Slides is included in the price of admission to Santa’s Village. Joy Ride Slides riders must: be at least 36 inches tall; ride alone; and ride feet-first, face-up, while lying flat on their backs. Sliders must wear smooth bathing suits – no rivets, buttons, buckles, snaps, or other items that might gouge fiberglass and cause scratches for people.